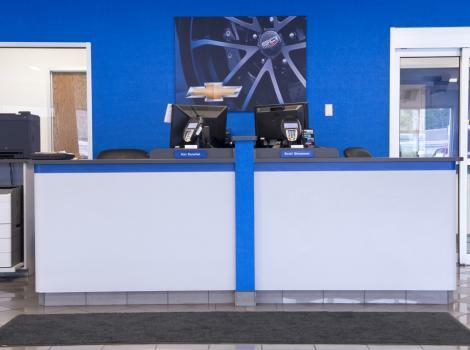 Penske Chevrolet has been a staple in the Indianapolis, IN dealership landscape for a long time but it was clearly due for an update to modernize and match Chevrolet’s new image program. So parent company PAG turned to the dealership experts at i.M. Branded to help transform their facility. 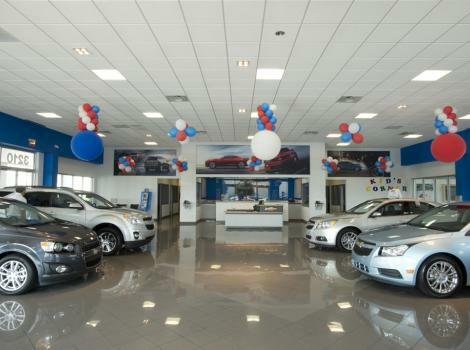 With a goal to meet Chevrolet’s dealership requirements while at the same time creating an environment uniquely tailored to the building, PAG utilized i.M. Branded’s expert site assessment and design services. Penske Chevrolet was completely transformed into a thoroughly modern facility featuring all of the latest Chevrolet image program elements along with a strong dose of individuality. All accomplished as a remodel without the difficulties and expense of a rebuild. Thirty-seven custom size and shape graphics were incorporated into showroom, service and parts, office, and other customer areas to greatly enhance the small graphic package that is part of the GM program. Millwork focus from i.M. Branded for this upgrade project included reception, sales manager, sales offices, service writers, retail parts, and showroom cabinet areas that were either newly constructed or re-laminated. The result is a virtually new dealership that provides a unique and exciting new experience at a familiar location well-know to local customers. With more than 20 years in business, i.M. Branded specializes in helping automotive dealerships maximize the impression of their facilities on their clients. State-of-the-art technology, refined installation processes and direct relationships with the world’s top automotive manufacturers give i.M. Branded the ability to provide OEM-approved graphic and millwork solutions to thousands of dealerships across the country. Unmatched attention to detail, and a company culture built on minimizing disruption during installation, make i.M. Branded the industry leader and, quite simply, best in class.